I really love robots! I love making them, but I’ve had a life-long fascination with androids, bots, and mechanical wonders. Here’s my overview. 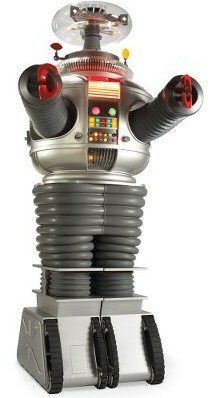 The first robot I loved was the B9 robot from TV’s Lost In Space (1965). Crappy show, but what can you say about a television series where the robot is not only the most interesting member of the crew, but also the best actor? Robby gets fresh with Anne Francis. Hubba. B9’s older brother is, of course, Robby the Robot from Forbidden Planet (1956). 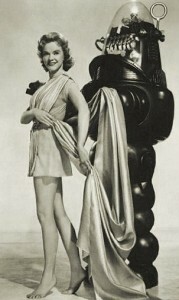 Until I was old enough to understand the message of Forbidden Planet, let alone appreciate Anne Francis’ marvelous gams, Robby was my favorite thing in the movie. There was a dearth of robots in the later 1950s and 1960s. Sure, I could go into some of the sillier examples, such as Robot Monster 3D, but he was just some actor in a gorilla suit with a diving helmet. No robot there. I think Hymie the Robot from Get Smart was hilarious, but he was just a guy with a box of wires on his chest. What made Hymie funny was that he took ever comment literally – kind of the precursor to the modern computer language. For most robot-lovers, the next step would be right to Star Wars. Nuh-uh. The next step is the oft-overlooked Silent Running (1972), directed by Douglas Trumbull. The three robots or “drones” in that film, Huey, Dewey, and Louie, have R2D2 beat on both the usability and personality scales. Bruce Dern communes with two of the Drones from Silent Running. The malevolent robot played by Yul Brenner. The robots in WestWorld (1973) were for your entertainment, or enjoyment, depending on how you wanted to interact with them. They were more androids than robots though, since they were played by human actors. The only robotic part about them was when their face came apart and you could see their wires. I believe Westworld was the first movie to employ that cheap trick. Mighty stiff acting from this T-800. The year 1984 brought us James Cameron’s Terminator, which made Arnold Schwarzenegger an international superstar. The robot was called a T-800, but it was really all Arnold. Did you know that the computer readouts from the Terminator’s point of view were machine code from an 6502 inside an Apple II computer? As the 21st Century dawns, robots in movies become more realisitc, or perhaps just more practical with what we know about technology. 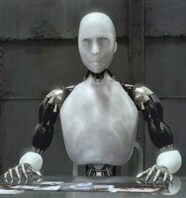 A case in point is Sonny, the android from 2004’s I, Robot. Sonny comes a long way from the clunky Robby the Robot and B9 of the mid-20th Century. That makes me wonder how silly he’ll look to someone from the year 2040. An honorable mention should go to the advanced robots at the end of Stephen Spielberg’s AI (2001). At the very end of the movie, which I find exceedingly sad, there are these translucent beings who rescue the Haley Joel Osment robot, David. At first I thought that they were aliens. Only later did I learn that they were advanced robots, the descendants of the film’s androids. Forget the Disney eyes, Wall-E is cool. Finally, there’s Wall-E from the 2008 movie of the same name. Endlessly charming, he’s also extremely practical and believable as a robot. His eyes may have been a little too Disney-esque for my adult tastes, but he wasn’t annoying. As a kid I used to love the film Short Circuit it reminds me of Wall – E a bit. I agree, however wheres R2D2 one the best robots, West World had a great use for robots actors that never get tired of being shot made to look stupid etc. The ending of AI Oh that makes sense, I thought they were Aliens too! Yeah, Leslie Nielsen was there with Robbie’s debut film, Forbidden Planet. That remains one of my favorite all-time scifi films.